The hacking possibilities for the Xbox 360 Kinect peripheral seem to keep growing every day. 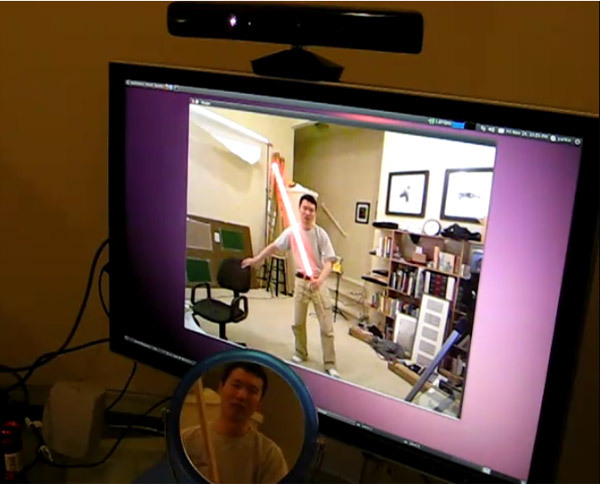 The latest hack to hit the inter-pipes: the Kinect lightsaber. Yankeyan used the OpenKinect drivers, along with image processing, tracking and rendering by OpenCV to create this great real-time lightsaber effect on his PC. All he has to do is pick up a wooden stick, and the Kinect tracks its position and the image processing software adds the lightsaber effect. Hopefully, LucasArts will oblige us with the same when their Star Wars Kinect game comes out next year. For now, Yankeyan’s hack will have to tide us over.